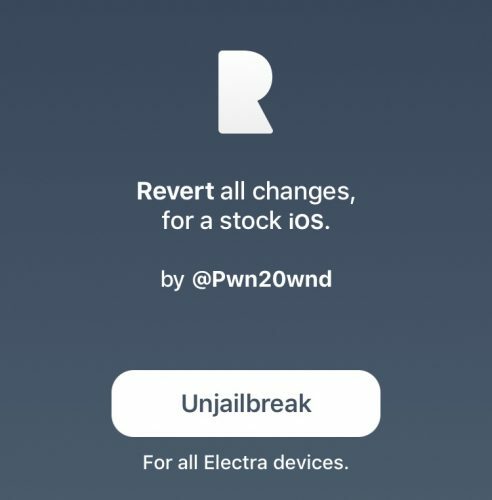 Electra Team member Pwn20wnd has released the waiting tool SemiRestore11 / Rollectra enabling any user who want to remove electra jailbreak iOS 11.3.1 - 11.4 to quickly use this awesome tool which will revert all changes for stock on iOS. So in case you are facing any troubles with the jailbreak and for any kind of reason you want to un-jailbreak your iPhone/iPad or iPod Touch then we've got the solution and you can follow our step-by-step guide below showing you how to remove Electra jailbreak using SemiRestore11 / Rollectra. 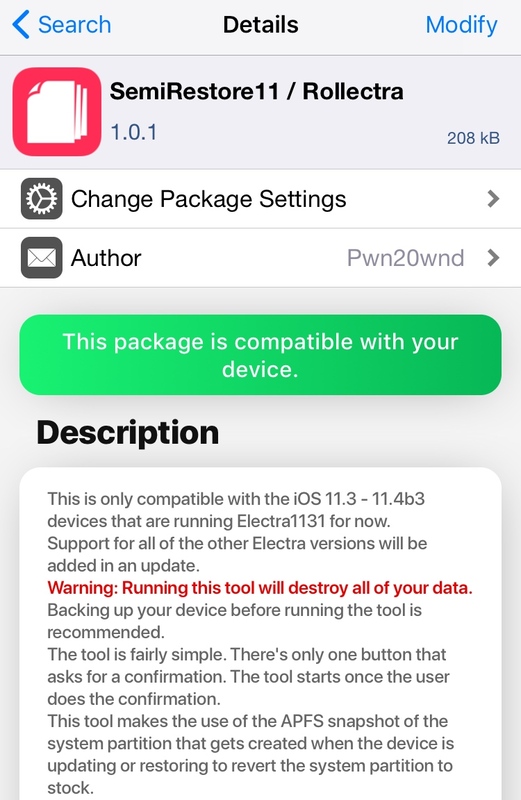 STEP 1: Launch Cydia and search for SemiRestore11 / Rollectra it should be available at Packix repository, and should also be accessible from the Electra Team’s upcoming Cydia replacement, Sileo. STEP 2: Simply tap on "Install" to install it on your iOS device and after it is done you should see "SemiRestore" app icon on your iPhone's home screen. STEP 3: Tap on the app SemiRestore and you should see "Unjailbreak" button. Tapping on it will start the unjailbreaking process to your iOS device which purportedly uses APFS snapshots and mobile_obliterator to roll your device back to a stock and unmodified state. Is SemiRestore11 / Rollectra safe tool ? Probably most of you are scared from this tool because you think it may cause some problems to your iOS device after finishing up the un-jailbreak process. But according to Pwn20wnd, the process SemiRestore11/Rollectra uses is “very safe,” and shouldn’t yield any problems during the process. Furthermore, it doesn’t matter if your firmware is being signed or if you have blobs saved – the un-jailbreaking method should work either way. Additionally, many that have used the tool report that it works more quickly than Cydia Eraser, which was released by Saurik a few years ago to un-jailbreak earlier versions of iOS. One thing to note is that SemiRestore11/Rollectra destroys and erases any personal data stored on your device, so you should consider backing up your data with iCloud or iTunes before proceeding if you don’t want to lose your data.